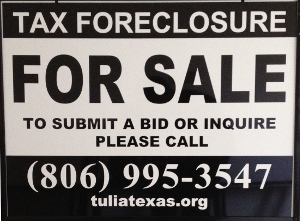 There are properties here in Tulia that are for sale! The best part about these properties is that there is not a set price. The Tulia Economic Development Corporation in conjunction with the Texas Communities Group, LLC will begin placing FOR SALE signs on available Trust Property within the City of Tulia in the coming days and weeks. There are over 75 tracts of land available now. Trust properties are lots and tracts of land which have been foreclosed upon to collect a tax lien due the local governmental entities, the City of Tulia, Swisher County, Tulia ISD, Mackenzie Municipal Water, and the Swisher County Hospital District. These properties were put up for auction and went unsold at the tax sale. The properties are then “struck-off” to the entities. The placement of the signs on available property will identify the properties available for purchase. There will also be listings placed on the City of Tulia website and in pamphlets disbursed amongst the community. Visit tuliatexas.org or facebook.com/CityofTulia for more information. Anyone over 18 years old can submit a bid for a property. However, a successful bidder CANNOT owe delinquent taxes on other property in the county, owe an unpaid fine or fee to the city and/or county, and/or own other property in the city/county that is subject to existing penalties for codes enforcement. Simply go to the Tulia City Hall and submit a bid, which is the price you would consider paying for the property you wish to buy. Should you meet the requirements listed above and your bid is sufficient and accepted, the property will be deeded to you upon receipt of the payment of your bid amount and fees to cover the cost of the deed and recording fees, which are minimal. IS THERE VALUE IN TRUST PROPERTY? There is a saying, that one person’s trash may be another person’s treasure! This is certainly the case with Trust Property. If you are interested in a property, there certainly is value to you. Maybe the property is next door and you can expand your yard or build a garage. Perhaps a property with a structure can be rehabbed into a profitable rent house. Never underestimate the power of an entrepreneurial mind! The process to purchase these Trust Properties is relatively simple, submit the winning bid! The paperwork and recording is done for you. Returning property back to the taxpaying citizens of the community is one of the focal points of the joint effort to clean up Tulia.